I know TB is a bit played right now, but these luxe hippie pieces for Summer/ Pre-Fall just sing! I agree with Tory getting a bit overexposed these days, but those are some great pieces! The clutch you posted was my end-of-the-school-year present to myself. Even though I technically have 6 weeks of teaching left, I had to have it! The bold red piece sings to me! Gorgeous. I never tire of seeing the latest from Tory. Love them all, especially that top one of the caftan. Great bright summer colors. I am in love with the caftan dress. It’s desperately calling my name. It’s great for summer and fall. Love, love, love, love. There can never be too much gorgeous in the world. I’ll take lovely and overexposed over hideous and overexposed any day of the week. I think the brand’s become so over-exposed because of that logo. I mean you see it everywhere. I am not a fan of it AT ALL. However, the clothing is just wonderful! Your blog is stunning! Isn’t it great when a blog you read regularly mentions another blog, which Ruby Press did today… love your blog; will certainly return regularly! One can never have too much Tory…….we love! Overplayed or not, I love Tory Burch. 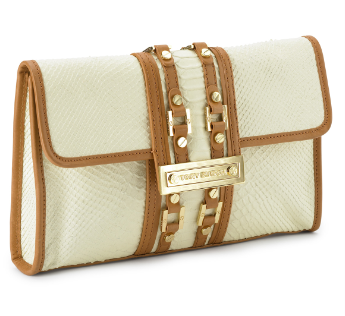 the things i would do for that faboosh python clutch….le sigh.